I just create, that’s what I do. Anybody that goes to the theater, I think we’re all misfits, so we ended up on stage or in the audience. I’m totally Italian, but I’m not a diva. If you could see the way I’m dressed in daily life, that’s not a diva. Appearances are so not important to me. The theater is a tough place. It’s not cushioned the way it is in film and television. We’re not show-business people. We have a life. Patti Ann LuPone is an American actress and singer, best known for her work in stage musicals. She is a two-time Grammy Award winner and a two-time Tony Award winner. She is also a 2006 American Theater Hall of Fame inductee. 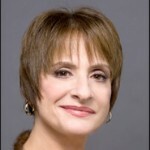 LuPone began her professional career with the The Acting Company in 1972 and made her Broadway debut in Three Sisters in 1973. She received the first of six Tony Award nominations for the 1975 musical The Robber Bridegroom. She won the Tony Award for Best Actress in a Musical for her role as Eva Perón in the 1979 original Broadway production of Evita.